Rare garnets are among our favorite gemstones. They combine very good hardness with a high refractive index that gives well-cut stones excellent brilliance. Since they are singly refractive, they display a purity of color that can be very attractive. And they are almost always untreated. Garnets mainly belong to 6 species -- pyrope, almandine, grossularite, spessartite, andradite and uvarovite. Tsavorite and hessonite, for example, belong to the grossularite species, and demantoid to the andradite species. But some garnet varieties are hybrids. Rhodolite is a mixture of pyrope and almandine, while mali garnet is a mixture of grossularite and andradite. One of the recently discovered hybrids is a pyrope-spessartite mixture that is known in the trade as Malaia or Malaya garnet. You may also see it marketed under the name Imperial garnet. It is found in a range of hues, from slightly pinkish orange to reddish orange or yellowish orange. Tone can vary from light to dark. Malaia garnet was first discovered in the early 1970's in the Umba River valley that borders northern Tanzania and southern Kenya. Deposits of similar material were also found in 1993 in southern Tanzania. There are also reports of some specimens from Madagascar and Sri Lanka, with some very rare pink specimens coming from Madagascar. 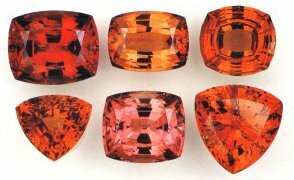 The preferred spelling for this garnet is "Malaia" rather than "Malaya" since the latter misleadingly suggests the gem is associated in some way with Malaysia. The word malaia actually comes from Swahili, where it means "prostitute". Miners gave it this name because when the gem was first discovered local dealers wouldn't buy it because it didn't fit any of the known garnet varieties. Now it is regarded as a rare and special garnet and it commands a premium price in the market. High quality finished stones over 3 carats are especially valuable. We have recently acquired some fine Malaia garnet rough, and have just cut a number of beautiful pieces, including several rare stones over 10 carats. 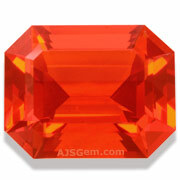 A splendid red-orange Malaia Garnet in a very rare size. This special gem has beautiful crystal (completely loupe clean) and has been precision-cut with a perfect polish. 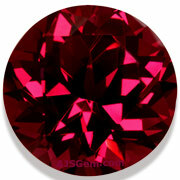 This is a fine gem for the garnet connoisseur and will look stunning when set in your jewelry design. Guaranteed natural and untreated. A sparkling white sapphire with superb transparency and clarity. Beautifully cut with no window, this fine gem has full fire and brilliance. A fine large sapphire for a special ring or pendant. Includes a certificate from AIGS. A gorgeous reddish-orange Mexican fire opal in a large size! This rare gem has an amazingly vivid color and has been precision cut to bring out out the full fire of this fine clean material. This beautiful stone will look stunning when set in jewelry. Guaranteed natural and untreated. 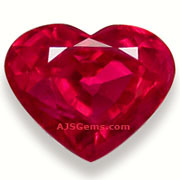 A gorgeous Burmese Ruby, this brilliant gemstone is perfect for your beloved. 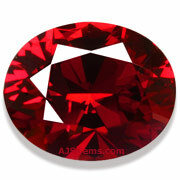 This gem is a deep saturated vivid red and is beautifully cut to maximize brilliance. Burmese rubies are well known for their superior colors in any kind of light. Certified as vivid red "pigeon's blood red" by GemResearch Swisslab (GRS). 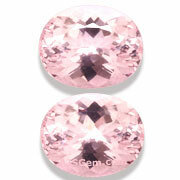 A very fine matched pair of morganites in the rare pink color. 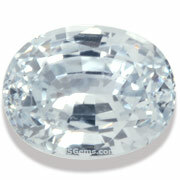 Superb clarity and precision cut with excellent luster. These fine gems will make an outstanding pair of earrings. Guranteed natural and untreated. A superb round rhodolite garnet in a large size, over 10 carats. This gem has been precision cut to bring out the full fire and rich color of this fine material. Completely clean and polished to perfection, this gem will delight the most discriminating collector. Guaranteed natural and untreated. Arnold had spinal surgery in Bangkok yesterday to correct a chronic back problem. The surgery was successful and he should be out of the hospital by the end of the week. We expect to see him back in the office later this month. We all wish him a speedy recovery! A 13.22-carat blue diamond was purchased for a record $23.79 million at Christie's Magnificent Jewels sale in Geneva, Switzerland. The diamond, the largest flawless fancy vivid blue in the world, was purchased by Harry Winston, which has named it “The Winston Blue." At Sotheby's New York sale a 28.12 ct square emerald-cut Kashmir sapphire and diamond ring sold for just under $5.1 million, setting a new record per carat price for sapphire. When we list a gem as unheated, it means that that it was not heated at any point since it was mined from the earth. Generally this is a fact that can be confirmed by gemological testing, by means of microscopic examination of inclusions, which will show the effects of high temperature heating. Some low temperature heating cannot currently be detected. You'll find that most of our unheated rubies and sapphires include reports from independent gemological laboratories. Some gems, such as spinel and the various garnet varieties, are almost never heat treated. Though Thailand has one of the fastest growing economies in Asia, it also has a history of political turmoil. From time to time the army steps in to cool things down. When this happens, it is usually a time of stability, though with restrictions on freedom of speech and assembly. For us it is business as usual. The airports are open and FedEx and the post are functioning. We expect things will get back to normal in a few months, with an eventual return to a democratically elected government. This is a cycle we have seen many times.